The begining of researches and experiments studies for the Vulcan rocket was ratified by the Soviet government in July, 1981 and by the specifications of the administration headquarters in July, 1982, according to the five year plan. The departure mass of Vulkan is 4747 t. The capacity of the payload at a 200 km height and a slope of 50.7° is 200 t, 172 t for a slope of 97°. 36 t for a geostationary orbit with the use of the block "Vesuvius", 43 t for an orbit towards the Moon and until 52 t for a flight towards Mars. 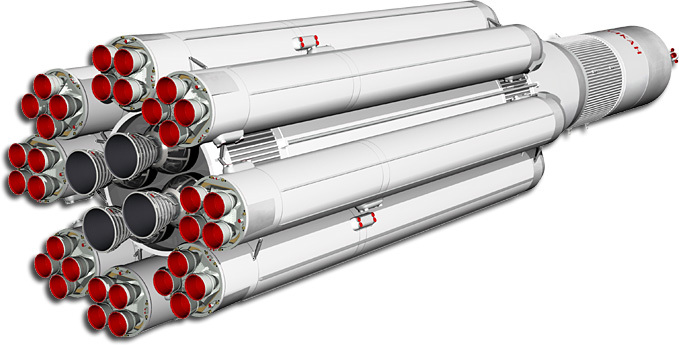 The central block of the Vulkan launcher distinguishes itself from the Ц block of Energia by: a tank's lengthening increased of 15 m, the change of the shape of the bottom of the superior oxygen tank, a cylindrical skirt on the engines RD-0120 (РД-0120) level (4 units), a symmetric arrangement of the tanks including pipings. The central block of the Vulkan launcher must be built at Kubichev (Куйбышев) in the Progress factory (Прогресс), the elements of the block A must be built at Omsk (Омск) by the company "the Flight" (Полет).